2015: Titles i hope to review…. I hope it also helps my fellow readers and bloggers know what is coming…..
Joan Breton Connelly is Professor of Classics at New York University.She has held visiting fellowships at All Souls and New College, Oxford, at Harvard University and at Princeton. 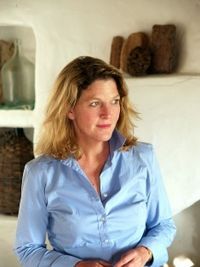 She is the author of Portrait of a Priestess: Women and Ritual in Ancient Greece. A radical new interpretation of the meaning and purposes of one of the world’s most iconic buildings. For more than two millennia, the Parthenon has been revered as the symbol of Western culture and its highest ideals. It was understood to honour the city-state’s patron deity, Athena, and its sculptures to depict a civic celebration in the birthplace of democracy. But through a close reading of a lost play by Euripides, Joan Connelly has developed a theory that has sparked fierce controversy. 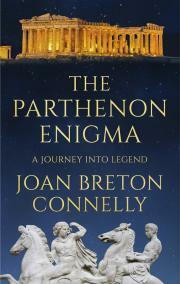 Here she explains that our most basic sense of the Parthenon and the culture that built it may have been crucially mistaken. Re-creating the ancient structure, and using a breathtaking range of textual and visual evidence, she uncovers a monument glorifying human sacrifice set in a world of cult ritual quite alien to our understanding of the word ‘Athenian’. I don’t often step outside my comfort zone of fiction, but every now and again there is something that is just too tempting to resist. Thanks to the fantastic fictional author Christian Cameron i have developed a passion for things set in ancient Greece, i strive to learn and know more, but often struggle for time. What this means is that i can enjoy the history of something like The Parthenon Enigma and how it explores something new as a concept, but not because its a new concept, just for the history, i don’t know enough about the Parthenon to know the old and extrapolate the new ground. What i can say is that for anyone who loves history, be they serious historians or interested travelers in time like me, this book is a great read. For non fiction that i normally peruse through over a period of months, this book sped by in a matter of days. Maybe that’s the love of Greek culture and maybe its the style and content of the book, it is for the individual reader to decide. What i can say is that this book stands out from the pack, both in cover and content and is well worth the time and money to read. Max Adams is the author of ADMIRAL COLLINGWOOD (2005) and THE PROMETHEANS (2009), which was a Guardian Book of the Week. 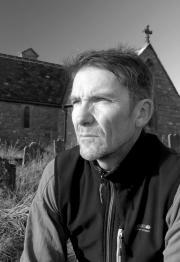 A university teacher, Max has lived and worked in the North-East of England since 1993. Oswald Whiteblade lived one of the most influential and colourful lives in early English history. Before his death in battle against the pagans of Mercia cut short his reign as king of Northumbria (634-42), he remodelled his northeastern English homeland as a Christian kingdom, founded the monastery of Lindisfarne, introduced a culture of learning which influenced all Europe, and became the most powerful ruler in Britain. Max Adams’s thrilling account rescues Oswald from Dark Age obscurity to reveal an unjustly forgotten English hero – a king whose return from exile to reclaim his birthright was the inspiration for J. R. R. Tolkien’s Aragorn in The Lord of the Rings. 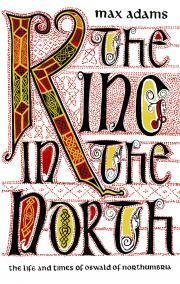 But THE KING IN THE NORTH is more than just a biography of the first great English monarch; it is a stunningly researched, wide-ranging, beautifully written and revelatory portrait of early medieval England in all its aspects. Some non fiction reviewing for a change: A great book on the subject of Oswald Whiteblade, amazingly someone I knew little about, and that is a bit of an embarrassment for me and more so for the Historical education provided to me at school. The World of Historical fiction opens us up to so many tales about so many rich and wonderful periods and people, i’m amazed that not one writer has taken on the rich tapestry that is Oswald. A man so influential in his time that he inspired Tolkien to create the character Aragorn one of the most notable names in Fantasy fiction, converted a kingdom to christianity, became the powerful figure in Britain. Truly a man to span the genres. Now I like many can steer away from non fiction at times as a bit dry and detailed, with no prose worth the description. But this book is beautifully written, in such a style its very easy to forget its non fiction, to get swept up in the history, the people and the period, to call it an epic tale would not be going too far, an epic tale written for the average reader, never talking down to you, sifting the fact from the fiction and painting a vivid clear image of a man, a king and a forgotten legend. What i need now is someone to write the fictional account of his life…. there is a whole series here guys!